*** 4-02-2014 PUPS AVAILABLE NOW!! MALE AVAILABLE $2600 NOW WITH 3 YEAR HEALTHY PUPPY TO ADULT GUARANTEE; NEWBORN PUPS AVAILABLE FOR FIRM DEPOSITS; AND TWO FEMALES DUE IN MIDDLE APRIL 2014. PRICES ARE 2400 TO 2600. Consists of fine integrated Hungarian and American bloodlines. 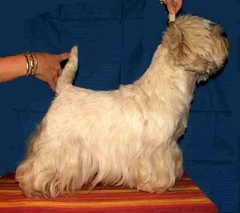 We place AKC West Highland Puppies for sale, Our West Highland Terriers of European bloodlines located in the outskirt of Apache Junction Gold Canyon area in Sunny Arizona. 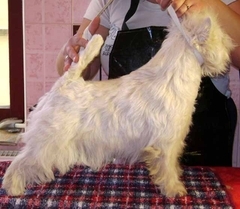 Where we raise fine quality Westie pups and Chinese Crested. We are proud members of the widely recognized AKC, AMERICAN KENNEL CLUB and MEOE-FCI EB/EUROPEAN CLUB. 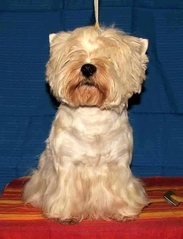 Some of the services we offer are as follows: West Highland Terrier "STUD" service and Chinese Crested "Stud" service to "qualified" pedigree. We also, offer "pet sitting" for holidays and or business trips on case to case basis. Our POOCH BOUTIQUE coming soon, offers a wide array of pet clothing , custom made jewelry and other unique products for your pooch. CAMMIES K9 FRIENDS IN SUNNY ARIZONA welcome just a few of our excellent International / Imported names and stellar AKC Champion bloodline into our kennel. Our gorgeous male "Dynamite Man Dumoulin De Mcmonique" and our exotic and timeless "Mcintosh Amrillis", along with our pretty girl "Witterung Klotild II" and her companion "Only For The Fun Cupid Boy". All are certified MEOE-FCI EB/EUROPEAN CLUB and have over 40 champions in their exquisite bloodline. Our canine friends are home raised on approximately 2 acres. Our home is very cozy and roomy. And on the premises we have a couple of annexes; a functional, professional kennel with individual doggie doors and pens and our puppies nursery. Both places are climate controlled to cool in the summer and heat in the winter. We have structured and organized schedules in our home. Our puppies are raised inside our home from birth to 8 weeks of age. By this time, the puppies will have been vaccinated with the necessary shots and transferred into the nursery where they will remain until they are placed. The puppies will get to enjoy fun in the sun/shaded areas and pool if weather permits. INTRODUCING OUR NEW BOY, "SHINING BRIGHT CHIPS HUNGARIAN", GRAND CHAMPION aka "G.Q." This boy is "GORGEOUS". We will keep you posted for any litters coming up! Although purposely structured to be a small kennel and breeder of select canines, we find that this works out wonderfully. Our goal is to accomplish a "well socialized and excellent tempered" puppy that will grown up to be a much loved and well mannered adult as part of the family. We do not breed "just pets" as we respect and hold highly what's in our beloved canine friends best interest. For this reason we believe in tending to them individually and fairly yet respecting that our canine friends are a "pack family" and they also need and learn from each other. We give them lots of love which consists of physical hugs, kisses and lots of baby/puppy talk. We are truly a happy family that enjoys and loves our furry friends. And transcending of our love, our belief and our goals for these precious canines. We are very selective as to where these puppies are placed. They are very special creatures of the purest of intentions that love unconditionally. 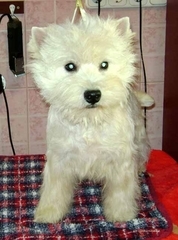 INTRODUCING OUR IMPORTED LADY FROM HUNGARY, "U ONLY YOU OF SURPRISE" AKA "SASHA". OUT OF HUNGARIAN CHAMPION BLOODLINES. We regret to say that we are not able to accommodate anyone without going through the application process, to handle and play with our puppies. Most importantly, because it's in our puppies best interest. Puppies are like babies and should never be exposed to situations that can be life threatening to them. As they can be susceptible to almost anything at this very young age. The future moms and dads of our puppies are required to fill out a placement application and can view our puppies by appointment only. If purchasing out of state, an application is taken and if accepted, pictures and age progression of the selected puppy will go out on a timely manner. Video tapes of the puppies and referrals are available upon request. "DAISY" is out of Daisy and Dynamit Man Dumoulin. She has a new home! "CONGRATS TO DAVID & JOHN!" 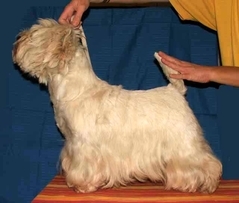 "Pete" is an excellent perfect puppy out of sire BOLDIZSAR'S PISTOL Hungarian. We offer shipping to almost anywhere in the USA for an extra charge of $375 which includes air fare, airline approved kennel, vet examination, vet certificate of health and more. *** Puppies are $2400 TO $2600 AND $2800 - $3200. *** We also offer a generous 3 year health "puppy back guarantee" due to a congenital defect or illness. We place puppies as members of your family with a signed agreement and mutual understanding that it's your responsibility to neuter and or spay your friend within five (5) months from their date of birth. Our contract also allows at 100% money back guarantee to have your puppy evaluated and checked by a licensed practicing Veterinarian within 3 working days of purchase in state and 5 days out of state. Currently we have puppies and young adults. Please inquire by email or give us a call. THIS LITTLE BEAUTY HAS WONDERFUL CONFIRMATION, SMALL EARS, DARK SKIN AND A BEAUTIFUL SPARKLING DEMEANOR AS HER MOM AND DAD.